Let's be blunt. 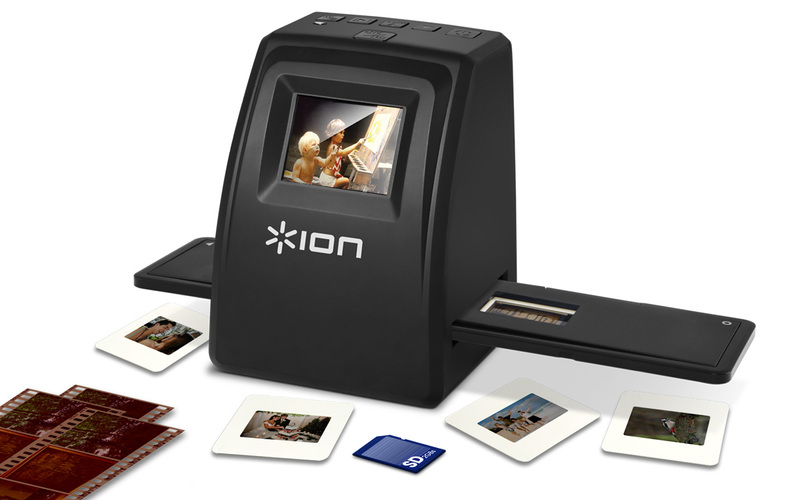 Isn't it about time you got all of those slides and negatives digitized? Sure, that used to be a monumental task, what with scanning, then importing the files into your processing software, adjusting, converting and then, finally saving them. Well, that excuse has been negated for quite some time now, thanks to the number of incredibly simple, powerful and affordable digital converters available out there. 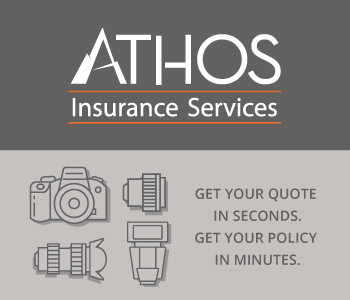 It doesn't get much simpler than this one. It simply scans your slides or negatives at 14MP resolution and transfers them to a 1GB SD card, which, by the way, is included with the converter. You don't need any software or a computer to use it, just a place to plug it in. There's a USB connector with a cable if you want to hook it up to your PC, and a video cable if you want to connect it to your TV and really "get the big picture". Exposure, white balance, and focus are all automatic, so although there's a built-in viewing screen, there's no fine tuning possible. If you're looking for a quick and inexpensive way to move your images from film to your PC, a digital frame, iPad (optional adapter required), or any other device, this is it. Another 14 MP converter with a built-in LCD viewing screen, this one comes with photo editing software, too. While exposure, white balance and focus are set automatically, there's a USB connection so you can download images to the computer to make adjustments. You can view them directly on your television with the included component cable. The included rechargeable battery comes with an AC charger or it charges via the USB connection. There's no internal memory, but an SD card slot allows for portable storage of images. This converter is quick, convenient and gives you more versatility with a handy software package, too. If quick and easy scanning of negatives, slides and prints up to 4” x 6” with a fast cleanup option appeals to you, then this little instant converter might just be the one for you. At 9 megapixels, resolution is on the lower end of the scale, but a one-touch dust and scratch removal system makes up for that a bit. This feature, dubbed “Magic Touch” by the manufacturer, is a valuable option for those who want to do a little touch up on scans without the need for editing software. There's a 2.7” LCD for viewing your scans, or you can view them directly on your TV with the included cable. There's a USB cable, too, for easy transfer to your Mac or Windows computer. A built-in SD/SDHC card slot lets you use up to 32GB cards, too. 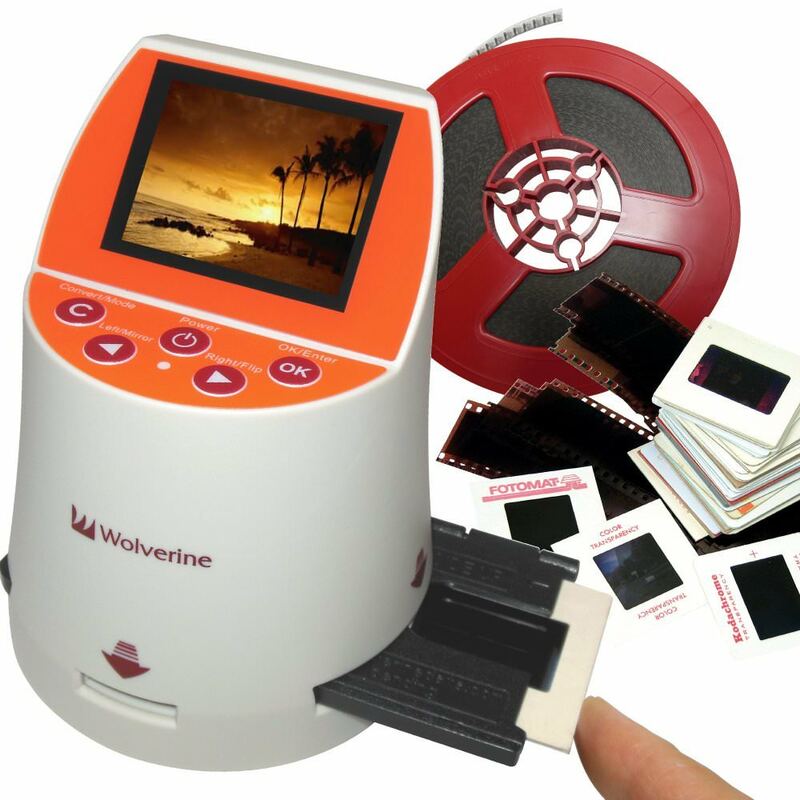 With the ability to scan 35mm film and slides as well as prints up to 5” x 7” , this converter almost takes the top spot on our list. Resolution is good, with a 14 megapixel sensor and the built-in flatbed scanner handles photos a bit larger than the standard 4" x 6" limit on most converters. Of course, it's a little larger overall than most, too, but still very portable. You'll need an AC outlet for power. While exposure controls are automatic, there's enough software on board to allow you to crop and make some adjustments to the images on the 2.4" LCD or, with the included AV cable, use your television for a better view. There's no on-board memory, so the output needs to go to your computer via the USB cable or there's an SD/SDHC card slot for more portable storage. 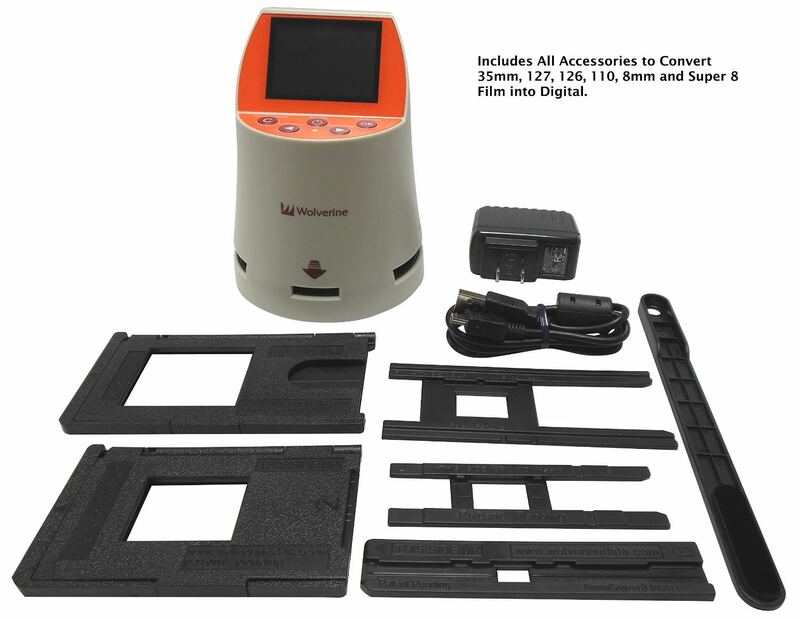 Although film size is limited to 35mm and this is the highest priced converter on the list, the photo scanner and editing options make it a good choice if you don't need to convert other film formats. It's all in the name. At first glance, you might think the lack of a print scanner would put this slide/film to digital converter farther down on the list. With all its power and features, as well as its stand-alone capability, we think it's absolutely the best choice, especially with the comparatively modest price tag. This one uses a fixed digital camera to almost instantly scan the film or slide at a whopping 20 megapixel resolution. That's almost one and a half times as fine as the closest competitors. It also has its own, 40-image internal memory, so you can use it without a computer. 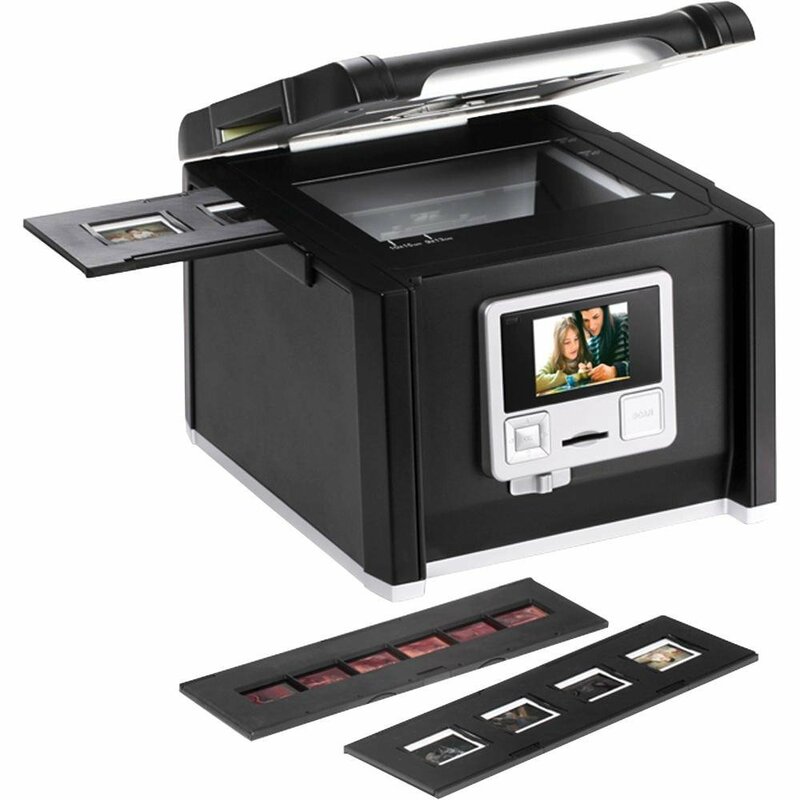 It handles 7 different film sizes with speed loaders for each included, so you can simply scan your negatives rather than worrying about cleaning up those old scratched up prints. You can also adjust exposure and colors manually if you need to touch up the automatic results. By the way, with 24-bit color capability, you can expect great color matching. Naturally, there's an SD/SDHC card slot, so you can take your scans directly to a digital frame or other device. USB allows you to connect it to your computer and you can use the TV out jack to view your image scans directly on your television. The F2D Mighty lets you create stills from your 8mm film, digitize your old 110 or 126 images and more, even without a computer. We think it's the best investment. Take a closer look here and see if you don't agree!